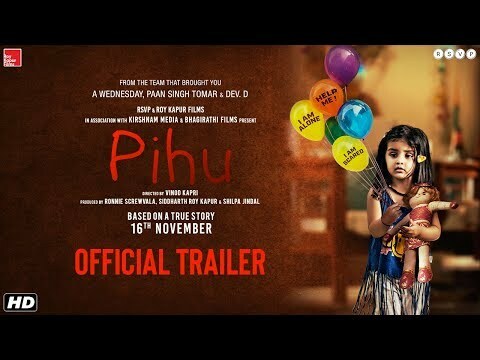 Pihu trailer : This story of girl left alone with her dead mom. The trailer of Pihu, an upcoming Hindi film about a little girl left alone in a house, has garnered a lot of positive nods. Several Bollywood tweeted about the film’s trailer, calling it the one movie to watch out for. The film is about a two-year-old girl left alone in a flat. All she has for company is, presumably, her mother’s dead body. As the trailer opens, viewers see a sweet little girl, Pihu, waking up, playing with her balloon, switching on the TV to dance to her favourite songs and a chaotic home with toys and household items scattered all around. We get to know that she is alone at home (we do see a woman lying on the bed but she doesn’t wake up). The little girl tried to wake up her mother, shakes her arm, slaps her face but she just would not wake up. All alone, Pihu first gets locked inside the fridge, switches on the geyser and other electrical items. Pihu also tries to fix herself a meal, first using a microwave and then on a gas burner. A child in such close proximity to fire surely makes the viewers nervous. Throughout the trailer, Pihu trips, falls, skips and at one point, her doll falls from the balcony of her high-rise apartment. When the trailer ends, we see her climbing on the balcony’s railing and we all skip a heartbeat. In short, the trailer shows that what is every parent’s worst nightmare.